Ulster Farmers’ Union president, Ivor Ferguson, says he was delighted to welcome over 300 guests including UFU members, key representatives from the agriculture industry, and leading politicians from our local political parties to the UFU’s annual dinner, which was held in the Lough Erne Hotel on Friday evening (5 April). Notable guests included Ian Wright CBE, Chief Executive of the Food and Drink Federation; Denis McMahon, DAERA permanent secretary; Norman Fulton, DAERA deputy secretary; and Richard Percy, NFU Mutual Chairman as well as representatives from the National Farmers’ Union, NFU Scotland, and NFU Cymru. “The UFU annual dinner is a night of celebration. Northern Ireland has an impressive story to tell when it comes to food and drink. We produce some of the highest quality food in the world and our family farming structure is unique and the envy of the world. The UFU president went on to say he was disappointed by Northern Ireland’s political stalemate. “We have heard the excuses but it is time Northern Ireland had a functioning devolved government again. Farming and food play a large part in the Northern Ireland economy and civil servants are making their own rules to the detriment of the farming industry. Poultry farmers are only the latest ones to suffer at the hands of an overzealous department,” he said. Following the president’s address, the prestigious Belfast Telegraph Cup for outstanding agricultural achievement was awarded to Thomas Gilpin. Photo one: The UFU South West Down group was awarded the Mary Wilson Trophy for the best overall UFU group performance in 2018. 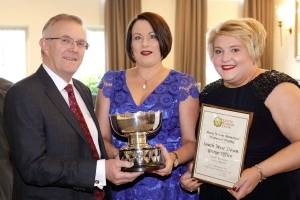 Pictured accepting the trophy is Sarah Macauley and Diane Simpson with Ivor Ferguson, UFU President. Photo two: This year the Cuthbert Trophy was awarded to the West Antrim group for retaining the highest percentage of their members in 2018. 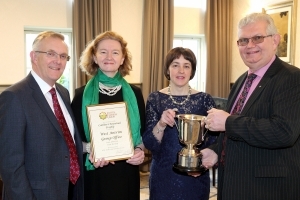 Pictured receiving the trophy is Ivan Johnston, Hilary Maybin, and Linda McNeilly with Ivor Ferguson, UFU President. Photo three: Thomas Gilpin was awarded the prestigious Belfast Telegraph Cup this year for his innovation in the vegetable sector. 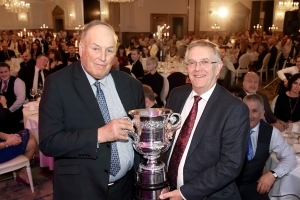 Pictured accepting the trophy is Thomas Gilpin, with Ivor Ferguson, UFU President.